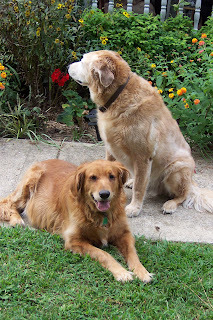 I really can't believe it was just over 2 years ago that I published my last dogblog. There are still a few faithful canines who have come back for more publicity! This fine collection of canine garden helpers has more than its fair share of senior citizens. I am proud to say I am the owner of such a senior dog. May I introduce Buddy. He is 13yrs old and he is a rescue dog from Battersea Dogs Home here in London. He is truly an inspiration, a dog of a lifetime, one in a million. This is Tommy, he lives with Bob on the estate. 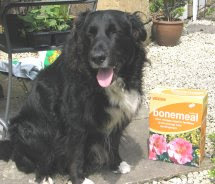 He is a terrific guard dog as you can see here he is guarding the bonemeal...(what else!) I must admit I have a very soft spot for Border Collies, so he is honoured with two photos! 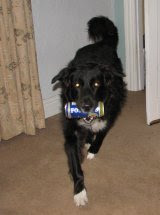 Tommy is clearly Bob's best friend, look at him here bringing in the tinnies! This is Sam, he will be 13yrs old in December. he lives with Peggy on her organic garden in beautiful Ireland. He is clearly descended from Royalty! Here is the famous Skippy who lives in his own garden Skippys Garden. There are a number of dogs here who have blogs named after them. Skippy is a beautiful Portugese Water Dog. Here is the most wonderful and sadly recently deceased Ollie aka Mr Hairy. He lived at the veiw from bag end. What a wonderful picture, it will bring back happy memories. All of us doggy people out here send our love. 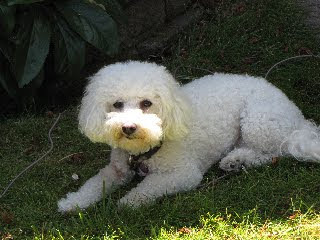 This is Gracie the Bichon Frisee who lives with Cath at A Gardener in Progress in Washington State. Apparently she is a little camera shy! Perhaps if someone invented a camera shaped like a bonio?? I love this picture. 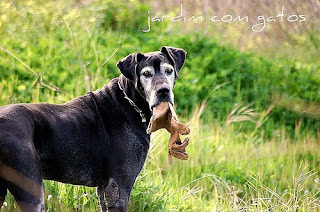 This is B the senior watchdog who lives with Gintonio at Jardim com Gatos in Portugal. B contributes to the gardening effort by digging the compost heap and stealing garden gloves! I just love this picture - Awesome! I can see this face is ready for excitement and perhaps a bit of trouble! This is Buffy who lives with Nell at seed scatterer. Buffy is an incorrigible helper! Just look at these two lovelies, BJ and CeCe who live with Tina Ramsey. Again here we have dogs who will not pose for photos! You are not alone Tina! 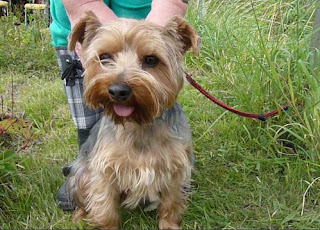 This cheeky chap is Billy, he hangs around on the allotment where Nic digs at Nip it in the Bud. He looks like a useful little chap to me. 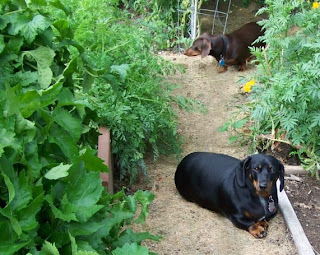 Just look at these two dachshunds Annie and her Brother Otto who live in Annie's Kitchen Garden. They are also uninterested in having their picture taken. I suppose there are more interesting things to do if you are a dog! 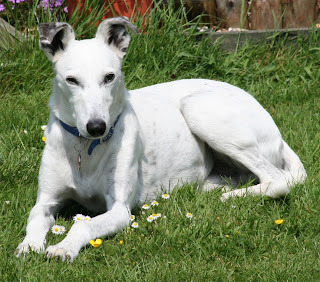 This is Bobby, he is a senior Lurcher who is a rescue dog living with John Midmarsh in Lincolnshire. Bobby is a rescue dog and he is 11yrs old. 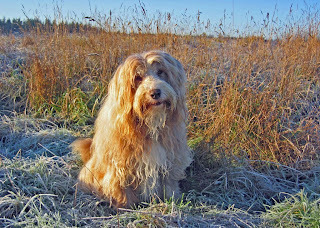 He is John's faithful companion and although his joints creak, his eyesight is failing he still makes the most of life! Three cheers for Bobby! This is another senior canine, LuckyDog who lives with scarecrow in Australia. 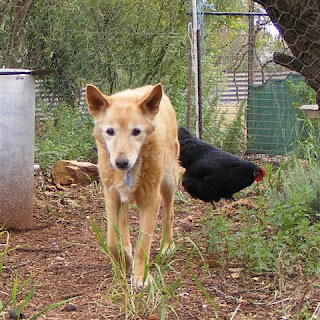 Here LuckyDog is helping to weed the garden along with her companion Blackie the chook. LuckyDog is a veteran of my first 2007 blog. Thanks for hanging around mate! You should hang around with Tommy and enjoy a few tinnies together! This is Maggie from grow our own. She has a boyfriend called Gus and a good pal Little Arnold. 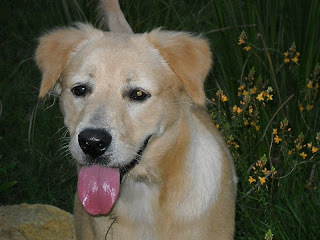 She is the good and faithful friend of Carrie from grow our own. Phew! hope you enjoyed my dogblog - I sure did. A million thanks to my canine friends and their companions! These Sungold tomatoes have been a winner in the garden this year. I splashed out and bought a packet of seed this Spring, they were expensive being an F1 hybrid, but with hindsight worth every penny. They were the first to ripen, and it looks like they will be the longest lasting too. I think this will be the last climbing courgette Black Forest in the garden. When I went on holiday in August a large marrow grew on the plant which told the plant it was time to stop. With a little TLC I have coaxed it into a few more weeks of productivity! These are the tomatoes which I 'liberated' last Autumn. I called them Great Wall of China, as the seed came from a tomato found growing there! Much better late in the season, a lovely little plum tomato, very prolific and full of flavour. Oh Dear! it looks as if I have leek moth damage! I have never had leek moth before, but I suppose it is the arrival of warmer climate which has brought this awful pest! grrrr! These are my wonderful Bulgarian Giant leeks which are growing great guns at the moment. Leek moth larvae go down into the white shaft of the leek and dig a labyrinth of tunnels in your leeks! Such a shame as it is about the only thing growing right through Winter and I rely on them! I climbed up the 311 steps up the spiral staircase of The Monument in the City of London. The Monument was designed by Sir Christopher Wren and built between 1671 and 1677 to mark the place where the Great Fire of London started in 1666. It is the tallest free standing stone structure in the world! My legs were aching on Saturday morning! This is the last reminder to get your photos to me for inclusion in Matron's Dogblog. I will be writing a post to celebrate our wonderful canine garden helpers! You won't be disappointed, the photos I have been sent already are amazing! Just a few days to go and snap a picture of your canine gardening assistant and email them to me. Join in with Matron's Dogblog, get them to me by September 28th and I will post them with a link to your blog. Thanks to those who have already sent photos, this is going to be a good one! I'm afraid this is my best effort! I don't think that my London clay soil is the best for carrots, even though I loosened it up with additions of sand to improve the texture. Still, if you are going for laughs, then this gets the biscuit! Perhaps I should run another competition - Matron's naughty vegetable show! Anyway, I know this is a vegetable blog, but I thought you might like to see some piccies from a short trip to Southwold in Suffolk yesterday. Nutters Cheese Shop is the most brilliant delicatessen you will find anywhere. I popped in for a slice of Stinking Bishop Cheese! Ahhhh Grommit! St Edmunds church towers over the village of Southwold, the sun shone all day yesterday. And we had lunch at the Sole Bay Inn - a plate of locally caught fish and chips, washed down with a pint of Adnams bitter. If you are ever in this part of the world, don't miss the opportunity for a visit. I am so pleased that despite the lack of any sort of Summer here in England, I managed to grow a nice collection of Queensland Blue pumpkins. Scarecrow very kindly offered to send me some seeds from Australia, as I remember growing them years ago and I just love the dry, sweet flesh that these Winter squash have. You can see the typical shape has pronounced shoulders. Do you remember way back in the Summer I was doing silly things to one of my baby pumpkins? Well, look what happened when it grew up!! Another late Summer success were these Conqueror sweetcorn. I planted a second crop about a month after the first, and they have come up trumps! It is a testament to the new varieties of F1 hybrids that are more suited to the unpredictable British climate, that despite the fact that these cobs have been sitting on the stalk for a number of weeks, they were still tender and very sweet! Well, here are my first crop of 'Dog Beans'. When I first read about these I just had to have some, and very kindly Gintoino at Jardim com Gatos was able to oblige with a few precious seeds this Spring. Fairly ordinary looking flat, dwarf (bush) bean with white flowers, quite prolific and a lovely taste. Looking forward to a larger crop next year. Just another reminder to send me a photo of your canine gardening companions for my forthcoming Matron's Dogblog. Please email them to me by September 28th and I will include them in my post. I had a perfect day out today, a trip to the Isle of Wight. I haven't been for at least 30 years or more and a visit was long overdue. The weather was perfect and we drove round the island. Lunch was taken at The Wight Mouse Inn. A highlight of the visit was a trip to The Garlic Farm who have been winning RHS Gold medals at shows and displays all over Britain. I've never been very successful growing garlic on my patch. I know the theory of how it should be grown but it doesn't seem to want to in my garden. With the purchase of some seed garlic today I will give it one last chance! 3 bulbs of Solent Wight, Chesnok Wight and Early Purple Wight should give me the best chance possible. I didn't buy any Elephant Garlic, a bit of a novelty item but I like my garlic hot and fiery and I hear this is a bit on the mild side. And finally my delightful travelling companions today, making sure that we enjoyed every minute of the day! This is by way of another reminder to join in Matron's Dogblog. 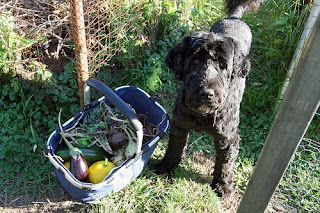 Please email me a picture of your canine garden helper by 28th September and I will be sure to add it to the post. I came by a large sack of pickling onions a few weeks ago whilst travelling in Bedfordshire. I kept them in a string bag to circulate air around them. Actually, this is one of my Father's string vests with the bottom sewn up! It is SO much easier to peel onions if you pour a kettle of boiling water over them for about 5 minutes to soften the skins. They can be peeled much more easily. The peeled onions must be salted for at least 24 hours. This removes a little of the natural onion juice which enables the vinegar to penetrate and preserve more effectively. Rinse and dry the onions and pack them into sterilized glass jars. It is then that I measure the amount of malt vinegar needed by pouring the cold vinegar into the jars. I replace about one fifth or 20% of the vinegar with water. I find it makes the final product less acid. I also add a couple of ounces of sugar. You cannot taste it in the final product but it brings out the flavour of the onions. Boil up the vinegar with some pickling spice and a knob of fresh ginger, bay leaves, dried chilli. Just bring it to the boil for a few minutes to bring out the taste of the spices and to dissolve the sugar. Strain the hot vinegar to remove the spices and pour over the onions in the jar. I usually put a teaspoon of the used spices into the top of the jar. Agitate the jars to remove air bubbles and seal immediately. PS. I've just purchased a doggy DNA test kit! At last you can find out what mixture is in your mutt! Buddy is thrilled! The results will be in the post in a couple of weeks. Just in time for the posting of Matron's Dogblog. Please email me a picture of your canine garden helper by 28th September. 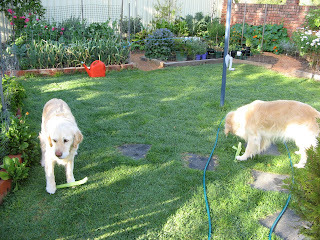 So many of us garden bloggers out there have canine helpers to supervise our daily activities. I thought I would plan a whole post dedicated to them! Go out and take a snap of your best friend helping out, and email it to me by 28th September. Be part of Matron's Dogblog!